Nicola De Maria, La testa dell'artista cosmico: Universo senza bombe, 2013. Painting on wall. Photo: Bruna Biamino. Private collection. He paints, he draws, he thinks, he lives, always and everything at the same level of intensity and meaning. Nicola De Maria reveals his soul in this great retrospective that the GAM in Turin dedicates to his works on paper – more than 300 – from the Seventies until today. It’s a rare occasion to understand and study the peculiarity of his work for it’s really through this medium that one can reach deep to the backbones of his research, unveiling at the same time the essence of his message and the complexity of his thoughts. I met De Maria at his studio in 1981 at the time of his solo exhibition at the Giorgio Persano Gallery in Turin, Dipinti che avvolgono l’Universo and now I have the opportunity to reconnect to his aesthetic realm. Born in Foglianise near Naples in 1954, in the late Sixties he moved to Turin where he still lives and works. After an early interest in photography around 1975 and his first solo exhibition at the Lucio Amelio Gallery in Naples he turned his attention to drawing and painting. As De Maria often remembers, he had to be very bold to choose painting in Turin in the mid-Seventies, when the atmosphere was utterly imbued with and dominated by conceptual art. For an artist of his generation to cope with the solitude that his artistic choice implied resulted in a major challenge, combined with the main one of finding and developing his own visual language. In 1979, De Maria was invited by the Italian art critic Achille Bonito Oliva to join the Transavanguardia Italiana movement together with Enzo Cucchi, Sandro Chia, Francesco Clemente and Mimmo Paladino. More than a reaction to conceptualism, the work of these five artists rediscovers the joy and lightness of the acts of drawing, painting, sculpting. On the basis of this common ground Bonito Oliva could add the abstraction of De Maria to the relived figurative work of the other four, an abstraction that always suggests a stream of thoughts, a narrative. The exhibition in Turin is a collection of sheets blown by the wind – as the title reads- where we can see the research of an artist who always privileges drawing and colour as the essential tools of his own world. Written words, poems working as titles are integral parts of De Maria’s work. Filigree letters…painted poems…the writing is a drawing in itself. De Maria once said that in order to fully understand his work one has to learn to read his painting and to look at his writing. He imprints every new work with sediments, memories, histories of previous works and all of this is even more evident in this exhibition in which the installation is organized not chronologically but by themes, assonances, affinities. All the works are equally important, the smallest drawing on a notepad sheet being as intense as the large mural on the wall. 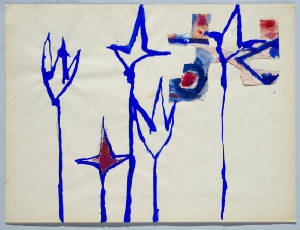 (disegnare la vita profonda), 1984 mixed media. Small works—drawings, collages--are presented in small rooms where they are sometimes arranged in a line or hung close together to create a quadreria. One can meditate in these intimate spaces while listening to De Maria’s thoughts whispered from the walls. Every work – as De Maria asserts- has the ambition of moving emotions in order to bring human beings closer to Nature’s own rhythms, as close as the connection between winds and sea currents. Drawing for this artist is never the first step on the path towards the creative process; on the contrary, it is the ultimate moment in this same process. A drawing is a work complete and defined. 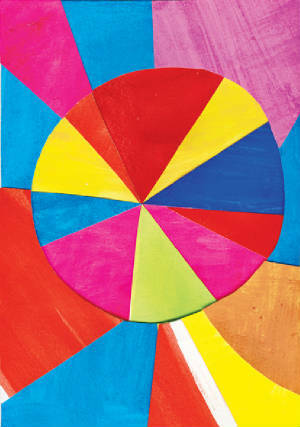 To underline continuity in his work, Nicola De Maria has conceived six new works for the exhibition at GAM, five of which are works on paper, two of large dimensions –Il desiderio comanda di occupare tutte le case, 2013: same title, same dimensions, same media but the combination, the juxtaposition of colour and space give life to endless possibilities of different images. The sixth is an in situ installation, a mural –La testa dell’artista cosmico: Universo senza bombe, 2013. This is a triptych to be read as a compendium of De Maria’s poetics. 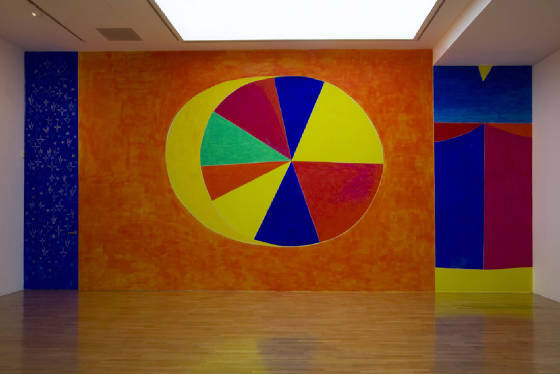 The left panel is a starred blue sky, the right panel is a curtain drawn on in vivid colours: cobalt, magenta, blue, yellow…The main section is a vast orange field on which a sun-like segmented circle, a wheel of colours, reflects pure joy. DeMaria’s first mural appeared in his solo exhibition in 1977, La Leggenda, painting on wall, at the Franco Toselli Gallery, Milan. Since then his colour has left the confined space of a sheet of paper to invade and overwhelmingly occupy walls and ceilings. The layering of colour results in an affresco painted with the technique of the Italian Old Masters. Non avendo viaggiato per mare, 1978 was DeMaria’s first exhibition at the Giorgio Persano Gallery in Turin and the beginning of a long and intense fellowship between the artist and the gallerist, a relationship that De Maria remembers as an experience of free will, fantasy, pure art. Numerous exhibitions followed over the years and with other international gallerists like Annemarie Verna, Zurich, Karsten Greve, Cologne, Lelong, Paris. In 1980, 1990, 1993 he participated in the Venice Biennale with an entire room, in 1982 in Documenta7; other retrospectives include exhibitions at the Stedelijk van Abbe Museum, Eindhoven, Kunsthaus of Zurich, 1985, Seibu Museum of Modern Art, Tokyo, 1988, Musée des Beaux Arts, Nimes, 1990, Macro, Rome, 2004, Centro per l’arte contemporanea Luigi Pecci, Prato, 2011. The extreme, refined simplicity of DeMaria’s juxtapositioning of colours and the line of his drawing, bared of any substance, reduced to essence, indicate an elegant sensibility and disclose De Maria’s modus operandi which implies solitude and great discipline. Rigorous ethics and passion translate his dreamy inner poems into an elegy of colours. Abstraction and colour. The exhibition at GAM can be read as a huge single work in the sense that every single element in its uniqueness recalls the complexity of the whole in a never-ending combination. A big mural or a very intimate small drawing vibrates with the same intensity as a poem handwritten by in pencil or of flowers and stars stylized to suggest archetypes of an imaginative Universe. Floriana Piqué is an art critic and independent curator. She lives and works in London.